With political leaders and the media perpetually focused on the behavior of a young hereditary leader and his nuclear-armed military, does anybody really care what happens to ordinary people in North Korea? There are two major constituencies internationally that do care: the humanitarian community and the human rights community. When widespread starvation in the Democratic People’s Republic of Korea (DPRK) became evident in the mid to late 1990s, humanitarian agencies launched a massive and largely successful rescue effort to stem the famine. Human rights organizations have meanwhile played a pivotal role in exposing North Korea’s dismal record of abuses, culminating in the recent appointment by the United Nations Human Rights Council of a Commission of Inquiry (CoI). 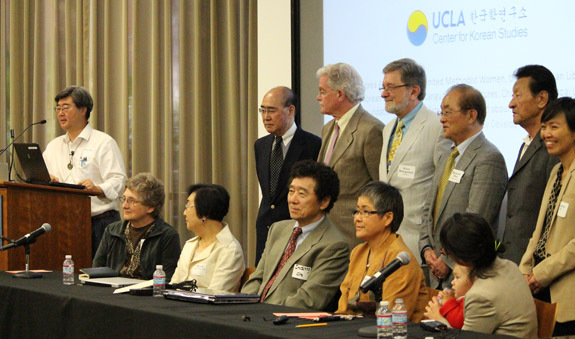 The UCLA Center for Korean Studies hosted a conference entitled “Ending the Korean War” on May 9, 2013. The meeting brought together a wide range of speakers — historians, sociologists, former missionaries, peace activists, Korean War survivors, and people currently engaged in humanitarian projects in North Korea — to reconsider how to end a war that never technically ended. Instead of a peace agreement, the United States and North Korea signed an armistice agreement in 1953 on behalf of their allies on each side. Sixty years later, the Korean Peninsula remains heavily militarized, the United States has still not recognized North Korea, and acute tensions between the two states earlier in 2013 threatened to lead to military conflict.